But the common denominator at so many of those rallies was the sound of Motown, the once fledgling and once black-owned record label founded in <?xml:namespace prefix = st1 ns = "urn:schemas-microsoft-com:office:smarttags" />Detroit 50 years ago today. The campaign’s embrace of the Motown Sound was likely not happenstance nor simply inspired by the president-elect’s fondness for soul music from the 1960s. More probably, it is the result of the campaign’s legendary attention to minute details and the understanding that the Motown catalogue was uniquely suited to bring together a nation of disparate opinions, concerns and beliefs. When Berry Gordy, erstwhile boxer and assembly-line worker, founded Motown (then called Tamla) in 1959, the pop-music industry was little more than a hustle. But like so many post-war industries, the record business was a hustle that was intimately tied to the American Dream, and men like Gordy, Leonard and Phil Chess, Jerry Wexler and Ahmet Ertegŭn, hitched their ambitions to the sounds emanating from black America. To that end, Gordy’s artists were enrolled in what was essentially an in-house finishing school: To his credit, he turned a group of lower-middle and working-class black Detroit youth into some of the most popular figures of the 1960s and 1970s. Indeed, the Motown Star system turned Diana Ross—never the best singer on stage or the prettiest woman in the room—into the very symbol of glamour, particularly for a generation of Americans who were not familiar with black women such as Lena Horne or Dorothy Dandridge. Gordy’s strategy was simple; capture the attention of white audiences in the span of two minutes and 30 seconds with a series of catchy hooks, easily-remembered lyrics and sweet harmonies and make them comfortable with the black artists delivering the goods. By the end of Motown's first decade, the company was easily the most recognizable black brand in the country, if not the world, even as the tenor of the times and cutting-edge production of the late Norman Whitfield pushed the label’s music more in sync with the militancy of the day. If Motown hadn’t produced another record after it jettisoned its Detroit roots in the early 1970s for Los Angeles, its legacy as one of the most important black-owned companies would have remained intact. But by the early 1970s, Gordy saw Motown as much more than a record company, branching out into film, with movies like Lady Sings the Blues (1972), Mahogany (1975), The Wiz (1978), television (The Jackson 5ive cartoon series) and even musical theater with Pippin. When the Motown family came together in May 1983 for the television special Motown 25, Jackson was the most popular star on stage, and many remember his moonwalking performance as the breakout moment that signaled his transition into superstardom. The reason why Jackson’s performance could have such a cultural impact was because of the broad television audiences who had gathered, in part, to reminisce about the promises of an era had long passed. Motown 25 marked a turning point in Gordy’s changing relationship with the record company. Increasingly, Gordy devoted his efforts to the business of protecting Motown's legacy, just as the burgeoning home video (beta and VHS) and digital music (compact disc) were changing America’s relationship with the entertainment industry. The result of those efforts is that nary a cultural memory of the United States in 1960s is complete without some reference to Motown, to the extent that almost all black popular music from the 1960s is referenced under the umbrella of Motown. Many lamented Gordy’s sale of the label in 1988, although he retained control of the Jobete song publishing company at the time. Gordy understood better than most how valuable the Motown catalogue would become in future years. There’s rarely a “feel-good-movie-of the-year” released these days that doesn’t feature a song—a Motown song—that Jobete owns. There was a watershed moment when the film The Big Chill was released in September 1983. It featured a soundtrack released on the Motown label that included tracks by The Temptations, Smokey Robinson and Marvin Gaye, alongside tracks from Three Dog Night, The Rascals and Procol Harum. On the surface, The Big Chill, which depicted a reunion of white adults who attended the University of Michigan in the 1960s, seems far removed from the social realities that produced Motown. But, the reality was that the movie was about a group of moderately successful whites lamenting the loss of the progressive idealism of the 1960s in the face of advancing Reagan-era conservatism. Throughout the film, the music is a reminder that part of that idealism included a commitment to racial and social justice. When tracks like Stevie Wonder’s “Signed, Sealed, Delivered” blared out of speakers at Obama’s rallies, it was a subtle reminder to a generation who came of age to the music of Motown of those same commitments. 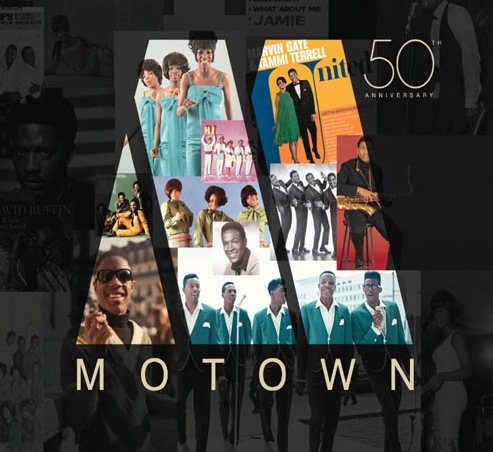 **Order your own copy of Motown: The Complete No. 1's from Amazon.com!